Royston Mueller, McLean & Reid LLP has been a staple of the Baltimore County legal community for decades. 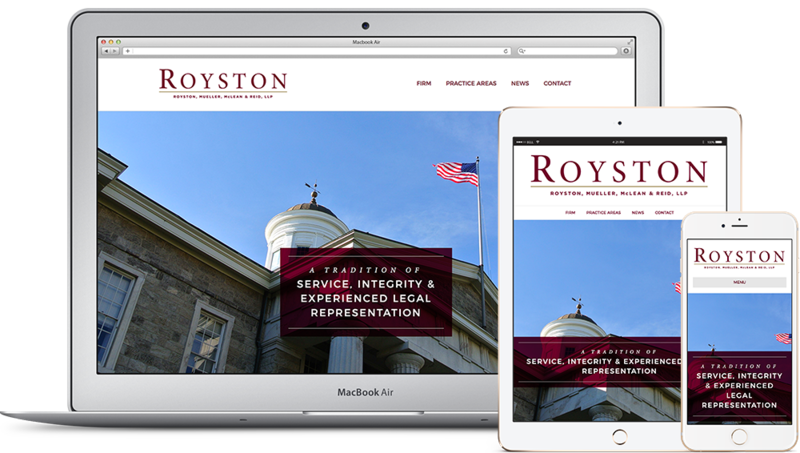 Their re-branding effort was designed to lend affirmation to their long standing reputation and tradition of service, which as a mid-sized firm had grown familiar enough to so many in the community that they are able to be identified colloquially as "Royston. As the oldest/longest practicing firms in Baltimore County we wanted to create something that felt traditional yet modern. We decided to go with Minion Pro, a Renaissance-era inspired serif typeface that is sophisticated, clean, and gracefully balanced. We paired that with Gotham, a confident and fresh sans-serif typeface that evokes a feeling of old industrial America. Together, the fonts create a feeling of trust, tradition, and quality. It was important for us to create a series of logo variations, which would marry variety with cohesion and consistency. Full, short and thumbnail variations were created for all logo formats, and the "R" in Royston became a key icon in the thumbnail variations. Beginning with Wireframe, the critical first stage of our design process, the team established a skeletal framework for the site. With a set order of information and basic layout, we were then able to move on to the finer details. Now thoughtfully chosen colors were added to the layout we had developed on Wireframe. We decided on burgundy with gold and leather colored accents. Burgundy is warm and traditional, and references the strength of brick. Leather also connotes strength and toughness, while gold is evocative of prosperity, compassion and wisdom. Finally, we settled on clean, minimal icons and fonts for easy reading. When viewed as a whole, we believe the color, icon and font choices give Royston an image of strength, security and warmth. Creating an easily navigable, welcoming homepage was critical for us. The large judicial image and tagline evoke the safety and security established by the color, font and icon choices. With a clean layout and easy-to-reach "Contact Us" section, Royston clients feel comfortable, trusting and heard. We matched the inner pages to the homepage, continuing with the clean, navigable and strong feel. Knowledge is power, and so the inner pages we designed are informative, providing insight into practice areas and available lawyers for quick contact. To prevent an overload of text, however, we added plenty of applicable images and icons, creating a balance of word and visuals that is pleasing to the eye. The design team understands the importance of creating a mobile-friendly site in our on-the-go society, and so worked hard to build a layout that would transfer seamlessly across all platforms. The end result is a web page design that remains strong, beautiful and useful, no matter the device it is viewed on.